UPA-USB programmers will help program the Toyota/Lexus smart keys when all keys are lost. UPA v1.2 or UPA v1.3 … cheap way to have a try! 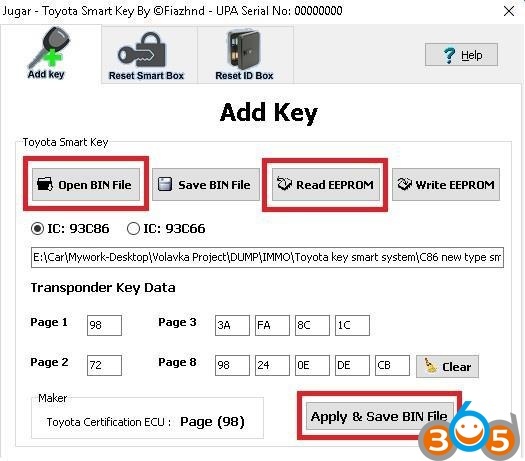 There are three ways to program smart keys to Toyota or Lexus when all keys are lost. Reset the Smart Box and ID Code box and learn 2 new keys with Diagnostic (This is really a rough, painful and lengthy, job to remove the whole dash to get access to the ID code box, mostly behind the Heater Matrix). 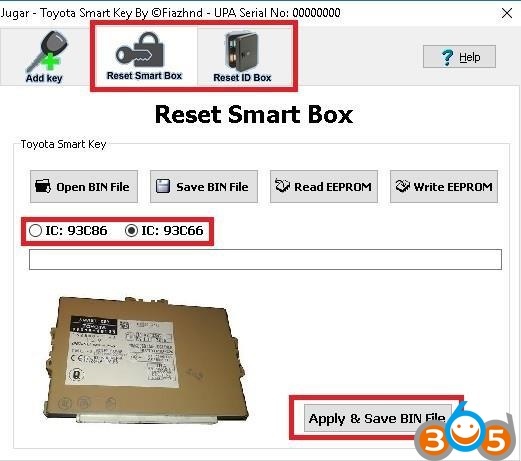 Add a second hand key into the smart box with Jugar – Toyota Smart Key Solution, which will take it out from immobilised situation and after that you can learn, even a new key to start the car up with diagnostic Which is a very quick, safe, and cost effective to customer and very easy for locksmith. Note: The second hand key will only start the car up, the remote function will not work with it. 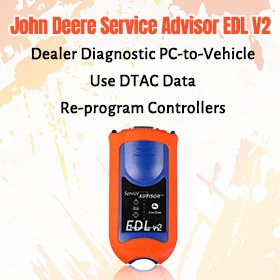 You need to learn a virgin new key with the diagnostic tester to use the remote central locking facility. Second hand key can be reused as many times as you want. Toyota Avensis or any other Toyota, or Lexus car’s which contain the Page 1: 98, data. The First and most important step you have to do is to select the IC Type, which are two types, as you can see IC: 93C86 or 93C66. 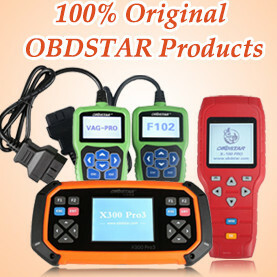 If you select the wrong IC: then editing is going to be wrong and the car will not start. 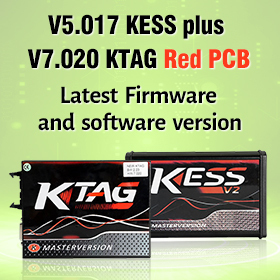 Get the second hand key, read it with any machine like CN900 Mini cloner, whichever is compatible to read these kinds of keys. The key data is going to look like this. Make Sure you match the Page 1: data from the 2nd Hand Key and the Page 1: data from the bin File requirement, which appears up automatically in Maker section. Page 1: Page 2: Page: 3 and Page: 8 Boxes. Click the Apply & Save Bin File. Fit the smart box back into the car. Now your car is out of Immobilised condition and you can start the car up, with the 2nd had key. (You are not going to be able to use the remote transmitter with this key, you have to programme new key diagnostically to get the full functionality). 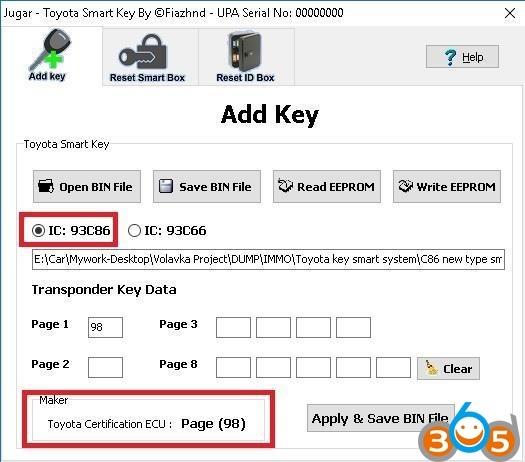 After resetting the ID & Smart box you are going to be able to register the new keys into the car diagnostically.This function is available to reset the ID box & Smart Key Box. Just simply read the IC: 93C86 or IC: 93C66 from the smart box, and IC: 93C46 from the ID boxes. Load the bin files up in the software One by one. Click applies and Save as button. 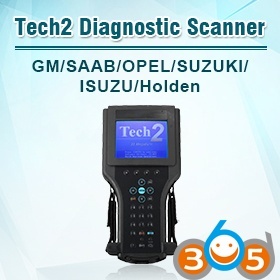 The file is going to be modified to reset position and go to learn the key mode by diagnostically. Just save the modified file and write it into the EPROM back, solder it, install the box back to the car, learn the keys and start the car up. 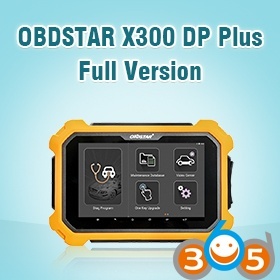 Personally I think the add key functions is the best option, because if you use the reset option you have to remove the whole dash up and get the ID box, which is very time consuming and very harsh to the interior fitting of the car.